Motels - Campgrounds - Fishing Lodges - Resorts, and more... We have the reservation form that is 'just right' for your business! 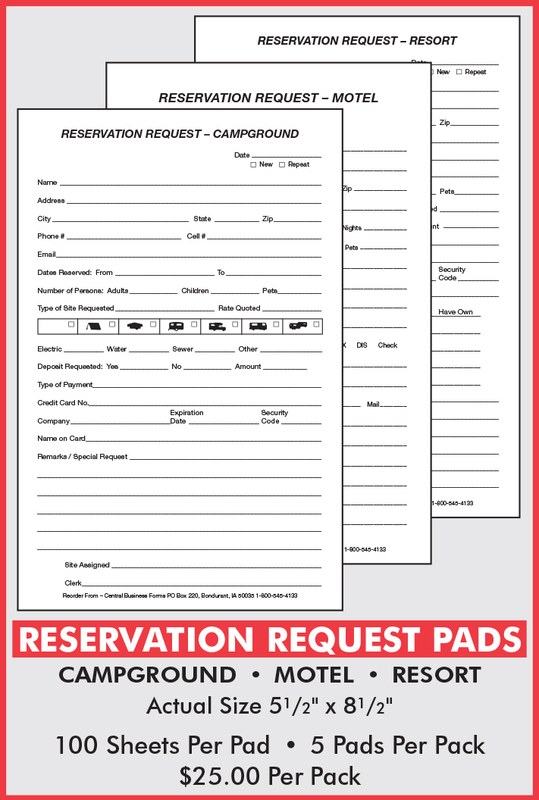 Whether it’s a card or a multiple part form, let’s get down to business with printed standard or custom reservation forms! At TBL Print and Central Business Forms, we specialize in printing everything from custom business forms to carbonless reservation forms for motels, hotels, parks, campgrounds and RV parks. Printed reservation forms need to be precise and work well for your business in order to make organizing and managing your business much easier for you—that’s where we come in. For years we’ve been creating the ideal, customized reservation forms for our customers not only throughout Des Moines, Clive and Bondurant, but throughout the United States. So what are you waiting for? Call us at 800-545-4133 or stop in and we’ll get started creating a standard or custom printed reservation form for you, or you can choose from our wide array of options. 3 standard forms to choose from ... OR, have your very own custom pads designed just for you! Check out forms 701- 702 - 703 (envelope)!